This paper introduces generalized state values to the anticipatory learning classifier system ACS2. Previous studies showed that the evolving generalized state value in ACS2 might be overgeneral for a proper policy representation. Thus, the policy representation is separated from the model representation. A function approximation module is added that approximates state values. Actual action choice then depends on the learned generalized state values predicted by the means of the predictive model yielding anticipatory behavior. It is shown that the function approximation module accurately generalizes the state value function in the investigated MDP. 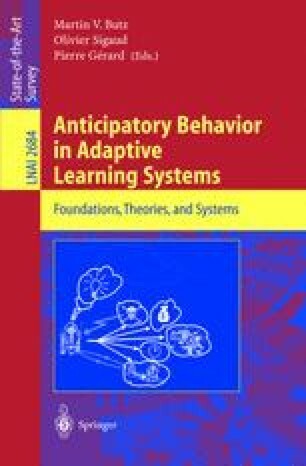 Improvement of the approach by the means of further anticipatory interaction between predictive model learner and state value learner is suggested. We also propose the implementation of task dependent anticipatory attentional mechanisms exploiting the representation of the generalized state-value function. Finally, the anticipatory framework may be extended to support multiple motivations integrated in a motivational module which could be influenced by emotional biases.